Some albums can get by just by being pure fun, as well as by having some extremely energetic performances, to help cover up for either a lack of fresh ideas or some less than great songwriting. One album that fits that description pretty well is Purgatorio, the third full-length release from Swedish heavy/power metal band Manimal. I was introduced to the band with their previous release, Trapped in the Shadows, and that was a similar case, except with that one as strong as the performances were, the songs were simply too plodding and lacking anything for me to grab onto, and so I quickly dismissed it and never looked back. I wasn’t exactly expecting much from their new album, but I decided to give it a go, and after a couple listens I found myself pleasantly surprised. The band certainly hasn’t reinvented the wheel this time, and the songwriting could stand to be a bit more varied in the second half, but overall it’s simply a fun album, full of classic heavy metal as well as a bit of power metal. 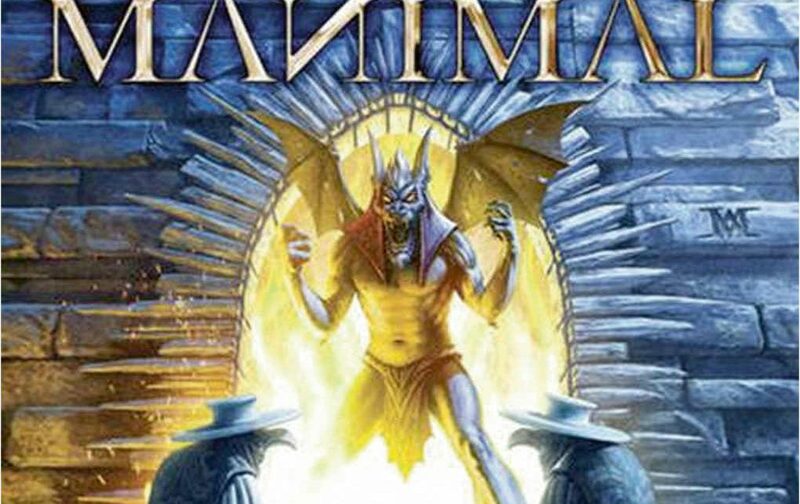 As far as a mix of heavy metal and power metal goes, Manimal’s music falls decidedly on the more aggressive side of the spectrum, at times reminding me a bit of Primal Fear, while at other times feeling quite similar to Brainstorm, when they’re at their slowest. So, basically, new listeners can expect some pretty hard-hitting material from Purgatorio, as it follows the same formula as their previous album and is very much driven by some heavy guitar work, as well as strong vocals. Musically, the riffs are very hard hitting and the drum work is quite good, with everything sounding very powerful and energetic. Performances are excellent all around and help keep me engaged, even during some of the less interesting songs. Speaking of which, the album gets off to a strong start, with a perfect mix of up-tempo power metal and more mid-paced heavy metal during the first four tracks, but once you reach the midpoint of the album, it ends up slowing down completely, with very little variety between the last few tracks. At the same time, the excellent guitar work and vocals certainly help make the songs enjoyable, and a couple tracks towards the end do feel a bit stronger than the rest, but it’s certainly disappointing to see an album start off so strong and then fade out a bit towards the end. One area where I knew the album would be great was in the vocals. The one thing I enjoyed about their previous release was the voice of Samuel Nyman, who has a rather over the top delivery that fits perfectly for a heavy metal sound, being able to deliver some pretty epic high pitched wails, while also being able to sing smoothly when needed. His voice ranges from being pretty deep at times, to being very animated and over the top at times, but he always sounds very powerful and energetic, and he manages to make even the weaker songs on this album more engaging than they probably should be. I was less confident about the songwriting, but while my concerns weren’t completely unfounded, I was actually surprised to find over half of the songs here to be quite enjoyable, with a couple, in particular, standing out as contenders for my favorite songs of the year. First up is the explosive opening track “Black Plague”, the unsurprising first single for the album, as after a cool intro, it quickly speeds up and turns it into the kind of hard-hitting, speedy power metal the band can excel at whenever they attempt it. This track, in particular, has a perfect balance between heavy riffs and wild vocals during the verses, as well as some excellent melodies and more smooth vocals during the chorus, to make it instantly stand out as the best I’ve heard from the band, and the guitar sound certainly reminds me of Primal Fear at their best. After that amazing opener, the title track manages to keep the momentum going, being slightly more restrained, though still fun track, moving at more of a mid-tempo, though still having a good pace to it. Compared to the rest of the album, I find it to be probably the most melodic, having some nice leads at the beginning, as well as a very strong chorus where Samuel really gets to shine. It still hits hard, of course, but it also adds in some excellent melodies to help make it stand out among the other similarly paced albums that appear later in the album. If anything, they could have placed it a bit deeper into the album to make the second half stronger, but it’s still excellent as is. After that is “Manimalized”, the comically named but excellent second single, which is the second and last speedy track on the album. It’s another very energetic track, full of excellent drumming, crushing riffs and a wilder but very fun chorus, where Samuel uses some pretty cool falsetto vocals and gets more crazy as it goes on. The pace slows down for the rest of the album, though the following two tracks “Spreading the Dread” and “Traitor” are two of the stronger tracks of the bunch, with the former being particularly dark and heavy, while still having a great chorus, while the latter has just a bit more speed to it compared to anything else in the back half, and it happens to hit just a bit harder and have a bit more energy to it, helping to make it one of the better tracks here. The chorus is a bit weak, but the excellent guitar solo in the second half helps bring the quality level back up. After those two tracks, the album goes downhill until the end, with all the remaining tracks being equally slow and having little variety between them. Out of the bunch, “Behind Enemy Lines” is the one track here that reminds me most of the previous album, being completely devoid of energy or strong melodies, making it quite the chore to sit through, while “Edge of Darkness” is a bit better, but still not particularly enjoyable. In between those two, “Denial” is another slower track, but the riffs hit a bit harder than the rest and the chorus and guitar solo are excellent, helping to make it a pretty solid track, if still not as good as the first five songs on the album. Closing the album out is “The Fear Within”, the calmest and most melodic track in the second half, opening with a nice softer section, before settling into a nice rhythm, with slight symphonic elements. It stands out as the best out of the last four tracks, thanks to being the most melodic and because it has an excellent chorus that showcases Samuel’s voice quite nicely, and the guitar solo in the second half is excellent. It’s the one track in the second half that approaches the quality of the first three tracks. Overall, Purgatorio is a slightly frustrating release, in that it manages to be much more enjoyable than the previous Manimal album I had heard, and it has a few truly excellent songs, but it falls apart a bit towards the end, with too many slower songs that do little to set themselves apart. Still, it’s a solid heavy metal album I can recommend to fans of the harder-edged side of the genre, while power metal fans should enjoy at least a couple tracks, and obviously existing fans of the band are sure to love it, as it feels more energetic and more enjoyable than anything they’ve done previously. I hope the band can put a more consistent album together in the future, but for now, this one stands as a pretty solid release, with a few particularly strong tracks.